Hortus Camdenensis | Iris graminea L.
Rhizomatous Iris with usually 4 long, slender leaves, longer than the flowers, and a terminal inflorescence of 1-2 flowers, lilac-purple, the falls flushed white, veined with purple. [RHSD, Hortus]. ‘The flowers expand in June and have a scent something like that of fresh plums. A native of Austria, perfectly hardy, and will grow in any situation. Our drawing was taken at the Nursery of Meffrs. Whitley and Co. Brompton. Cultivated here by Gerarde, in 1597.’ [BM t.681/1803]. 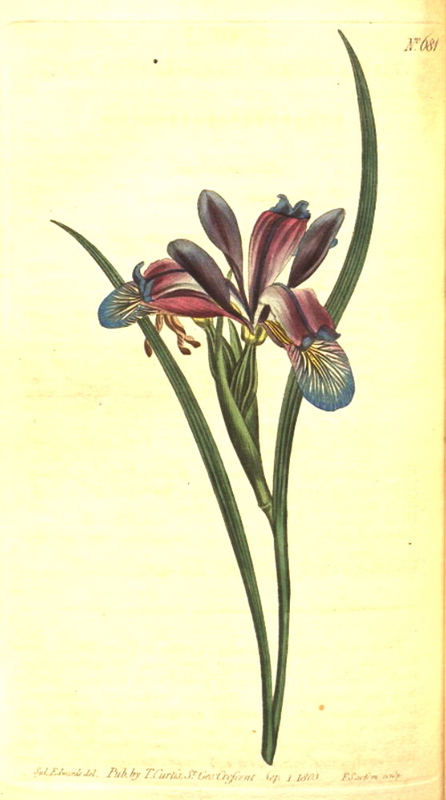 Iris graminea is marked with a ‘c’ in an 1836 edition of Loddiges’ catalogue held at Camden Park [CPA]. In William Macarthur’s code, used and explained elsewhere, this means grown at Camden. It is almost certain that it was grown in the gardens around this time but may have been short lived as it did not appear in the catalogues. Iris graminea Thunb. 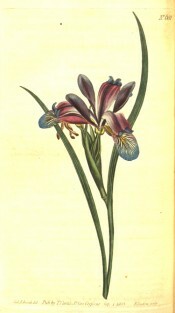 (1784) = Iris ensata Thunb. which see. Iris graminea Georgi (before 1802) = Iris ruthenica Ker-Gawl. Iris graminea Heuff. ex Nyman (1882) = Iris pseudocyperus Schur.